Looming over the Pasemah Highlands, Gunung Dempo is the highest peak in South Sumatra Province, and one of the dominant mountains of the southern Bukit Barisan Range. The climb to the summit is tough, but relatively straightforward; there are good water-sources along the trail, and if you arrange motor transport to and from the true trailhead it would be possible to bag the peak in one long day. 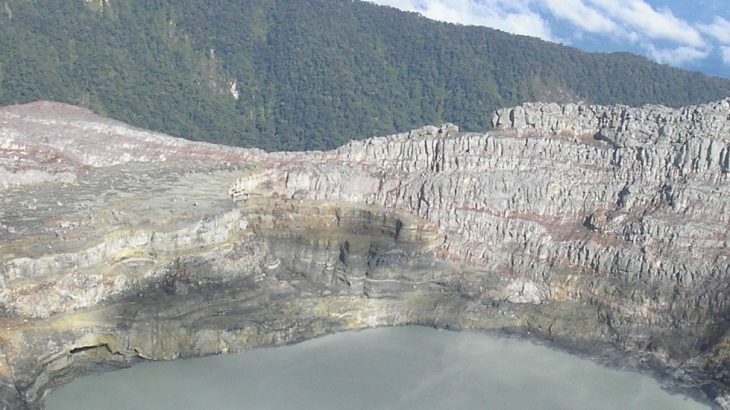 Dempo is best approached from the east, from the little upland town of Pagaralam, around six hours by road from Palembang, the regional capital, and a similar distance from Bengkulu, the main town in the neighbouring province. The countryside around Pagaralam is very attractive; there are some traditional villages, and a large number of carved megaliths and stone chamber tombs, strangely reminiscent of the Bronze Age monuments on Europe’s Celtic Fringe. Dempo dominates the region. 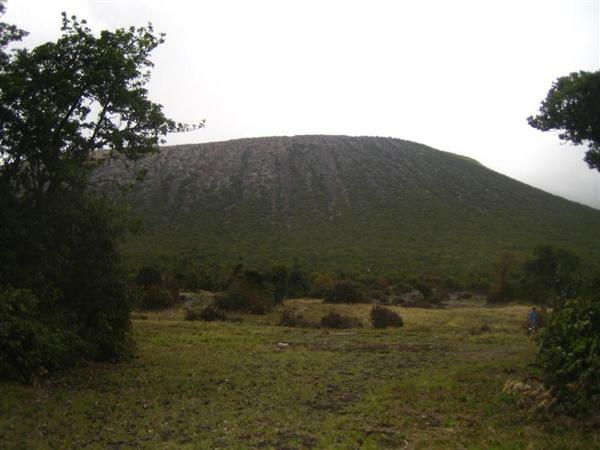 According to traditional beliefs its summit is the receptacle for the souls of departed ancestors, ruled over by a powerful deity called Puyang Raja Nyawe. Animal sacrifices are reportedly still made occasionally on the mountain, and trekkers are advised to be on their best behaviour while climbing! 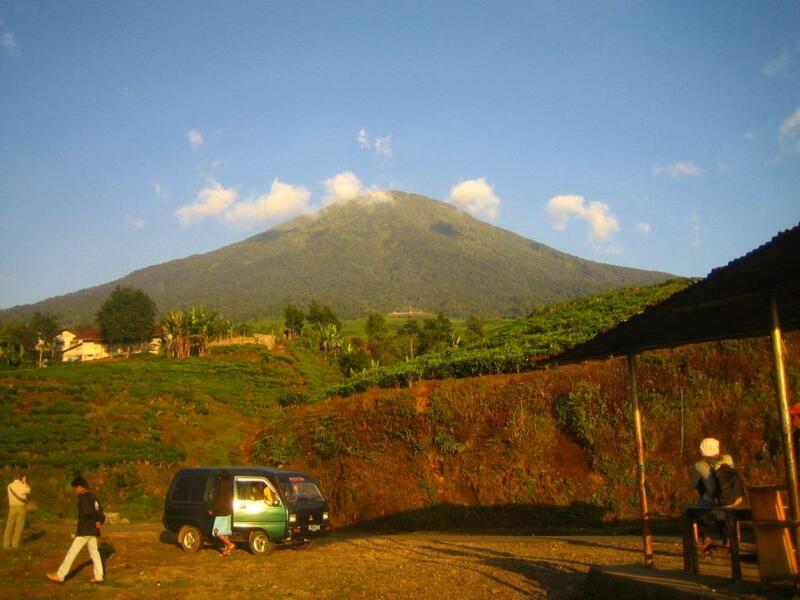 There are 4 routes to the summit and the most popular two – Kampung Empat and Tugu Rimau – begin in the tea plantations above Pagaralam. The peak is a popular destination for student mountaineering clubs from Palembang, as evidenced by a certain amount of litter and graffiti on the slopes, and there is a well-worn – though by no means easy – trail to the summit. The lower eastern slopes are cloaked in a huge state-owned tea plantation, and access roads lead right up to the tree-line. The most popular route to the summit starts near the small transmigrant plantation-workers’ village of Kampung Empat, deep in the tea gardens at about 1,650 metres above sea level. Public minibuses only run as far as the tea factory much further downhill, but you’d be strongly advised to organize transport at least as far as the turn-off to Kampung Empat, if not to the village itself – the alternative would be a very long slog up along a metalled road. 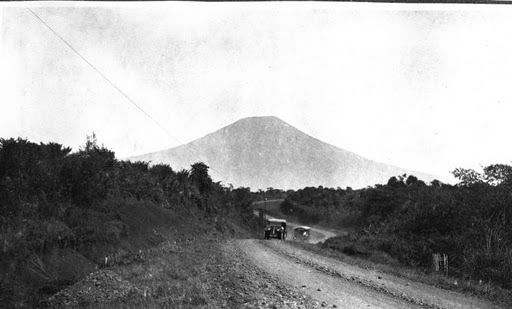 The track that branches off this metalled road to the left towards Kampung Empat is not signposted, but drivers from Pagaralam should know it, and if not there are always plantation workers around to ask. It is possible to drive all the way to Kampung Empat, but the walk along the track – around five kilometres, running level along the contours between the tea bushes – would be pleasant. There is one junction before the village – take the right-hand fork. A couple of hundred metres along the track beyond the village (a neat cluster of white buildings which has no shops, but which does have one small, hard-to-find warung with erratic opening hours serving instant noodles and coffee) close to a stream on the edge of the forest, is a small wooden hut, known rather ambitiously as “Resort”. Student groups climbing Dempo usually camp out here and start for the peak at around 2am. If you are not a fan of night-time climbing, and are looking to bag the peak with a single up-and-down assault during daylight hours you would want to start from Resort at first light. The spot is about an hour from Pagaralam town by motorbike. The real trail to the summit starts about a kilometre further south along the track from Resort. A narrow path leads uphill to the right through the upper tea gardens. It would be easy to miss, were it not marked by a large green signboard warning in Indonesian that the forest is a protected area. After a short climb through the tea bushes you reach Pintu Rimba (marked by a faded signboard) where the trail abruptly enters the thick forest that covers the slopes of Dempo. This first section of the trail is actually the least clear. The vegetation is thick and there are plenty of branches to duck under or scramble over. The trail itself, however, would be hard to miss as it is deeply eroded by water in places into deep gouges, which are not pleasant to walk along. It is also intermittently marked with strips of plastic twine tied to branches. Later the trail improves, but becomes much steeper, and the whole route up through the forest is characterised by exposed roots and some very steep sections requiring scrambling. Moving at a moderately sustained pace, it is about an hour from Pintu Rimba to “Shelter 1”. There is, in fact, no shelter here, but there is a small clearing marked by some plaques nailed to trees and some litter left by student trekkers. There is also a water-source, a little way down a slope to the right (if facing uphill). From Shelter 1 the trail continues very steeply through thick forest, with more exposed roots to scramble over. Moving quickly it is about another hour from Shelter 1 to Shelter 2. Again there is no actual shelter – just some litter, burnt-out campfires, plaques nailed to trees, and again, a water-source a little way downhill to the right. Shelter 2 is still in the forest, but the vegetation has changed here. There is less dense tropical greenery, and the branches are draped with the feathery grey lichen known locally as jengot angin, “beard of the wind”, and in English as “old man’s beard”. It is also high enough to be seriously cold at night. From Shelter 2 to the False Summit is around 1.5 hours. The trail remains very steep, but towards the top the vegetation falls back a little and the first proper view since leaving the tea gardens opens. If the weather is clear the dark ridges of the massif that makes up Gunung Patah should be visible to the east. If you have set out from Resort at 2am, you should be approaching the False Summit at sunrise. The False Summit (3,043 m, known as ‘Dempo’) is a rather underwhelming little hillock, still thickly cloaked with stunted trees. There are more plaques nailed to branches here, and a second trail – slightly shorter, and starting from Tugu Rimau at the very end of the metalled road through the tea gardens – cuts in from the north. 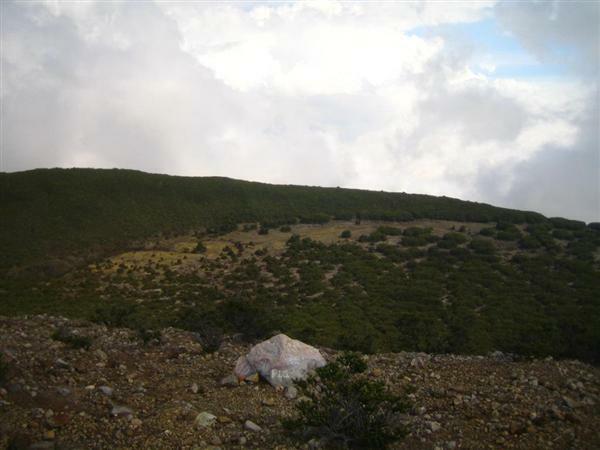 The true summit (known locally as ‘Merapi’) – or rather the outer slope of the crater rim – is visible through the trees however. Physically the final climb up a fairly gentle stony slope to the crater rim is the easiest part of the whole route since leaving the tea gardens, but it is high enough for the effects of altitude to be palpable. From the rim a view down into a deep crater with a blue-grey lake opens, with a line of forested ridges running away to the west beyond it. 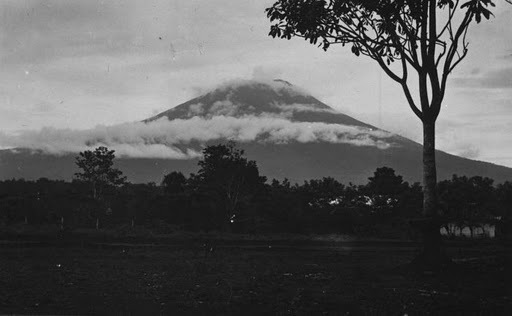 This actual apex of Dempo is known locally as Merapi. 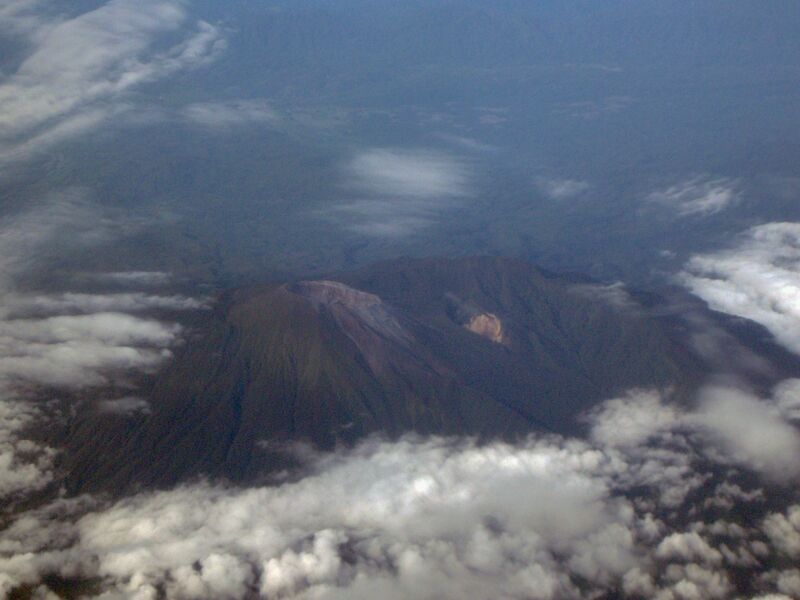 To the southwest, on a clear day, the coastline of Bengkulu Province is visible, as is the Gunung Patah Massif to the east. The highest point on the crater rim lies to the right and is easily accessible, though a full circuit of the rim does not appear to be feasible. Because of the steepness and roughness of the trail through the forest, the descent from the summit can take almost as long as the ascent (though rest stops will probably be shorter). Six hours is generally suggested as a typical journey time for the ascent from Pintu Rimba/Resort to the summit (though it is possible to do it in four if moving fast), while four hours is usually quoted for the descent. But even fit, experienced trekkers would be advised to allow around 12 hours – including rest stops and time at the summit – for the complete return trip from Resort/Pintu Rimba. On the return journey, unless you have made prior arrangements, transport from Kampung Empat will be tricky, and you’ll likely have to walk out at least as far as the metalled road, and possibly all the way down to the tea factory (though you may be lucky enough to hitch a ride out with a plantation truck). 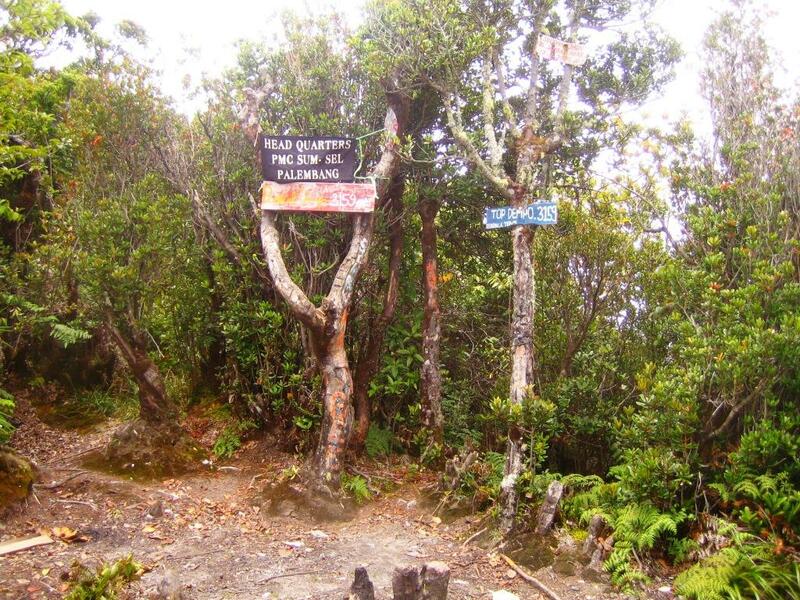 The second route that hikers with limited time might prefer is the route that starts from Tugu Rimau (1,850m). This is steeper and shorter than the Kampung Empat route and strong hikers can reach the summit in 4-5 hours. The trail is only a couple of kilometres away from the Kampung Empat route and is very similar, passing Shelter 1 (2,100 m) and Shelter 2 (2,670 m) – where there are no shelters – before reaching the northeastern top (3,025 m) of the False Summit. From here the trail leads along the flat ridge of the False Summit to meet the trail up from Kampung Empat at the point where the trail descends steeply to the large, grassy camping area (2,990 m). Getting there: Pagaralam is about 6 hours by road from Palembang and just over 4 hours from Bengkulu. There is a daily Wings Air flight from Palembang. Accommodation: In Pagaralam, Hotel Mirasa (Jl Kapten Sanap 62; tel: 62-0730-621266) has reasonable rooms and a helpful manager who can put would-be trekkers in touch with local climbers. There are also some marvellously located – but rather remote – bungalows and villas, on the lower slopes of Dempo amongst the tea gardens. You pass it on the way to the trailhead. There are large, expensive cottages but also some cheaper rooms. Permits: It is reported that trekkers are required to register before climbing at the tea company headquarters, but in practice, if you are climbing with a local companion, this can be overlooked. At weekends, you will probably have to pay Rp1,000 per person for entering the plantation and then Rp5,000 at the trailhead. Water sources: There are several water sources on or near the main Kampung Empat trail. For both Kampung Empat and Tugu Rimau trails there is a good source at the Plataran valley camping area at 3,000m. Sumatera Selatan Sangat Tinggi. permalink. Hi. I really want to hike Mount Dempo and i’m planning going there on this April 2018. But, may anyone suggest me who the guide or any group that i can join ? Hello, were you able to get any information on this? How was your April trip? Where did u ascend from? Which trail is shortest time? I have only 1 day to go up and down. Spent a great 2 days/1 night on Dempo. Hiked up the route from Kampung Empat after having a good dinner at the basecamp/house of Pak RT. Kampung Empat is a Javanese transmigration village so you will be greeted with the characteristic Javanese hospitality. Take some time to chat with Pak RT as he is particularly interested in hearing hikers opinions on how to reduce the large amount of garbage on the mountain. I would call the kampung empat route more of a climb than a hike as you’re going straight up tree roots and rock faces. Nothing terribly difficult and an enjoyable trek. From kampung empat to the summit took under 4 hours with the descent taking under 3 hours. Water sources at Pos 1 and 2 as described above. The water source at the summit is located in a gully and reliable and pristine. If you plan to spend the night at the summit, there’s beautiful spots for camping but note that temperatures will drop to below 10 C. Additionally I experienced wind gusts nearing 70 km/hour that knocked over a few trees and made the temperature feel even colder. Also take due precautions around the crater rim above the lake when taking selfies! The body of an ambitious selfie-taker can be seen floating in the lake. Currently (June 2016) the Tugu Rimau route is closed due to the upper part of the trail being burned due to a forest fire. The car park, shop, and bathroom at the starting point have also been closed. As public transportation can be rather difficult I recommend contacting Hotel Garuada in Pagar Alam to rent a motorbike for a few days (basic rooms from IDR 150.000) to get to kampung empat. The bike will also come in handy to explore the tea gardens afterwards. If you have time in Pagar Alam afterwards check out The Kopintels for the best coffee in town or Pagar Alam Rafting to experience some pristine rivers through Sumatran jungles. 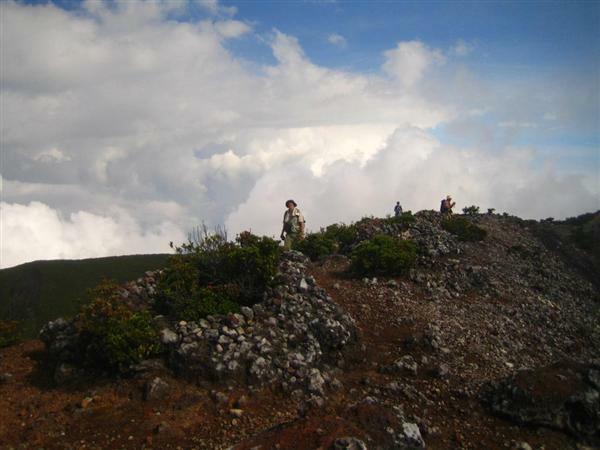 I’m planning a hiking trip to mount Dempo. Can I know how did you manage your trip? Did you book a tour with the local agency or hotel? I climbed Dempo a couple of weeks ago. All good; ascended and descended from Tugu Rimau, which seems now to have become the default starting point. Locals are always surprised when out-of-towners prefer to start from Kamoung Empat. Perhaps the path from Tugu Rimau has recently been improved? The shower block in the car park at the starting point is very welcome, especially after descending! There’s a good water source at the campsite on the level plain below the summit. Have recently done trail from Jarai-Bukit Timur side. This trail mostly used only by locals during big holidays and rest of the time is just virtually dos’nt see any climbers and remains relatively undisturbed compared to those more popular routes from Kampung Empat and Tugu Rimau. Despite that, I would really recomend to try this trail, as it much less eroded and clearer especially to that Kampung Empat, less steep and just allow you to admire a views lots more times starting just after 2300 m, it emerges to the openness and so almost to the summit. Also, the trail does’nt force you to negotiate with balancing on the rootes in order to avoid crambling through huge gaps in the path and jumps from 2 metres high edge with slipery trodden by many other hikers surface. 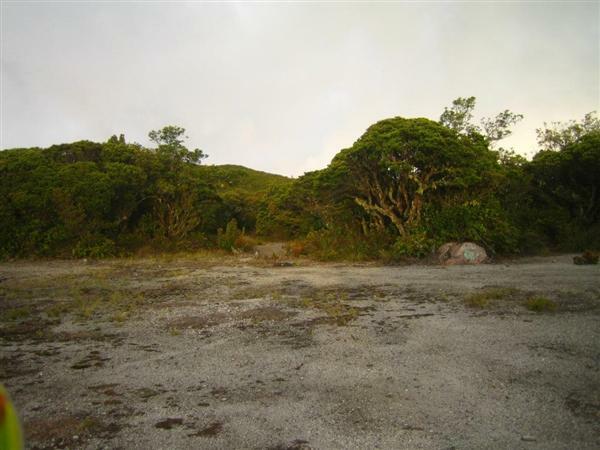 Then eventually you will find yourself on the eastern most accessible crater rim where there a remnants of old cement hut left and 2 small transmitter construction are there. So you dont need to go down valley and ascent the crater again. After some 20 km from Pagar Alam on the way to Kepahyang, turn left to Bukit Timur for some more 5 km. The idea to do this route has emerged since 2008 when I first climbed from Tugu Rimau and near the summit met locals who claimed reached crater from different side of volcano and the trip took them 3 days. Bukit Timur village surrounded by cofee plantation, lies on some 700 m, from where one need to continue up through cofee gardens until encounter the last farmers hut on about 1500 m. I first followed a wrong path and was several time pointed by villagers to the right and was said that I have should been to start from place called Talang Kayu Manis, to where I could come by asphalt road to the more higher elevation. Spent a night in a friendly farmers hut on the edge of forest, I have woke up in 4.15 and after short preparation had began to ascent. At first the trail was very overgrown and blocked with big trunks and bushes, seemed nobody has used it for a months. After somehow wading and cleared the way by hands, have found some kerfs on the trees and bacame more confident in moving further. Gradually, the trail got more determined the higher slopes I ascended. Just before dawn I was shocked by strange voice that sounded like dogs barking but much harsher just in 2 metres by me. I issued my own scary voice and scared this animal off, and it quickly escaped and disapeared in the lash forest canopy. Beyond this, on about 2300 m the trees became smaller and rocky volcanic surface allowed to open views and in this condition easy to follow path continued another 300 m vertical ascent before met a huge rocky outcrop to scramble over, but it only for 30 metres about 70 degrees fun. By one of that big rock is a suitable camping spot located, but allowed to place only one big tent and no visible water source around it. Further up one need to enter stumpy forest again for a while and after that presence of hardened lava suggests that I’m almost about to arrive to the summit. Just immidiately I was welcomed by strong wind that seemed intended blown me away over the crater. The lake was long time cnanged its colour since last time in 2008 I have visited it, when it has deep green beautifully apearance. Now and most of the time it has kind of milk white blueish colour. Anyways, was able to even to do a go around crater rim peering over ravines to the lowest point in the hope to find a way to descent to the bottom of the lake and finally failed due to its excessive steepnes. To be said, there is single suitable passage found on the north wall, but need to use ropes to do that. A success of getting to the lake bottom by other hikers has indicated by grafitty writings down there and the stones laid out there. But, even if one can do it, unless you dont going to dive, its dosnt necessarily means that one can touch the water, coz it lies more deeper under another additional wall which abrupty leads to the water. 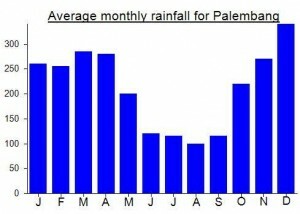 It must be somewhere around here, that in march this year a hiker from Palembang has fall to the lake and perished, after that the mountain was closed for a while and just recently reopened. Thus, done about 80% of the circle around the lake(rest of 20% is seemingly unpassable due to steepness), I eventually descended to the valley and ascended to what is strangely called “Dempo peak” although more knowledgeable climbers calls it “false peak” as it 100 metres lower than highest point of the rim. Funny that since 2008, the nameplate suggested that you arrived to “Puncak Dempo” disapeared and just a plates with some minor writings left on the trees. Need to say that Kampung Empat route, is one of the most uncomfortable to follow. Despite that there was at least 2 weeks no rain, the first upper section is extremly eroded and slippery coinciding with a small stream flowing through it and you need every time to scramble over root or jump, some section includes stepping inside kind of tunnel with a narrow sides that places only one feet and you need to be very lucky to not get dirty there. Just back from a trip to Dempo. Pretty quick now from Bengkulu to Pagaralam – only 4 hours now that the road has been resurfaced and thankfully no sign of the highways robbers. We managed to hire a car/driver for 550,000 each way. The hike itself was a lot easier easier than anticipated – me and Roman made it to the huge camp ground at 3,000m in just 3 hours. This was via the steep but short Tugu Rimau trail starting at an amazing 1,850m above sea level at a tiger statue and small mosque. They sell cups of local tea up there at weekends and the panorama over Pagaralam is tremendous. Myself and Roman made it up to the crater rim before the clouds completely rolled in. Spectacular views into the wide crater and the large crater lake. Lots of ancient cairns on the crater rim and a little vulcanology sensor at the highest point on the rim. If you have a GPS it’s a good idea to make a waypoint at the point where you reach the rim from the campsite because in mist it would be easy to miss on the way down. Maman was our guide (same as for Java Lava and Tim Hannigan’s trip, both of which took the Kampung Empat route) and he’s a very decent fellow but seems to have trouble finding enough porters to help out for even a small group of hikers. The last couple of porters arrived 8 and a half hours after setting off – we were lucky that we had one tent up there because it was dark and raining by the time they arrived. Watch out for mice searching your bags for food at the Plataran valley camping area – I saw about dozen of them appear after the sun had set and they nearly got my tempe. The night brought a little light rain but nothing major considering the time of year. The next morning was rather cloudy but we had perhaps 30 minutes of sunshine on the summit ridge before descending back to the tea plantation. We met no other hikers on the trail in either direction. There are numerous ‘villas’ to stay at in the tea plantation – a nice spot after coming down from the mountain, although we could have made it back to Bengkulu the same day quite easily. Back in Bengkulu itself there are some great historical sites, a decent beach to wander along and the rather swanky Horison hotel. Water is available at Shelter 1 and Shelter 2. At Shelter 1, when ascending, the spring is on the right side. The flow is very small. At Shelter 2 the stream is down below on the right side. At the Plataran valley between the 2 peaks, the water is sour because of sulfur content. At Villa Besemah, ask about pak Anton who lives 1 – 2 kilometers below behind the mosque at the opposite of the tea factory. He hiked G Dempo 72 x and is always eager to help everyone. He arranges porters, logistics, transports. He also accommodates hikers. • porters: essential – our porters had some initial problems getting themselves organised but they proved reliable and all turned out for the best. • heard gibbons and saw some birds including hornbill in the lower forest reaches. 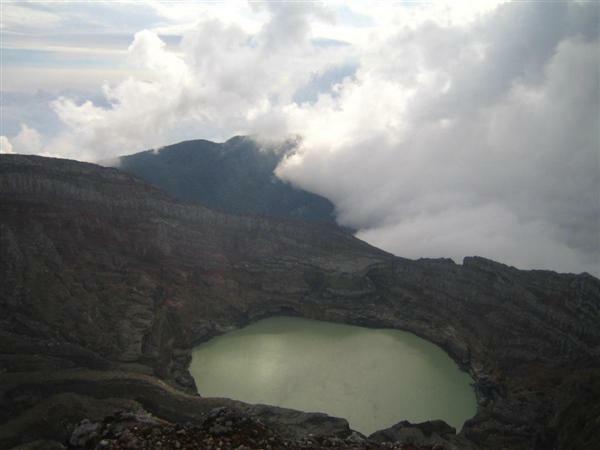 • great, in old crater – highly recommended, one of the best experienced; water available. • spectacular views into the crater. A very tough climb: highly recommended for Java Lava and other enthusiasts “because it there”. Not recommended for those requiring simply logistics and seeking a “pleasant” climbing experience.